A Moorish dynasty in northwestern Africa and in Spain in the eleventh and twelfth centuries. The rise of this dynasty marked a new epoch; for the first time non-Arab rulers occupied a Moslem throne. Yusuf ibn Tashfin, the founder of this dynasty, did not even understand Arabic. He was, therefore, unacquainted with many traditions and customs of Moslem government, but was also free from Moslem prejudices. Religious observances were anything but rigid; the treatment of non-Moslem subjects was, therefore, dictated by liberal principles. Yusuf was of a kind disposition and a lover of justice, and the Jews under his sway had little to complain of. In Africa he indirectly provided new homes for them by founding Morocco and Tlemçen (1062), and no doubt also brought about a welcome change for many Jews living in Spain when he conquered the Ommiades. Only on one occasion is he said to have threatened the Jews of Lucena with compulsory change of faith; but they ultimately bought him off with large sums of money. Under the rule of his son Ali (1106-43), when the Almoravides were at the height of their power, Jews occupied important posts. The poet Solomon Al Mu'allim (Abu Ayyub), praised by Alḥarizi for his great talent, was his physician. 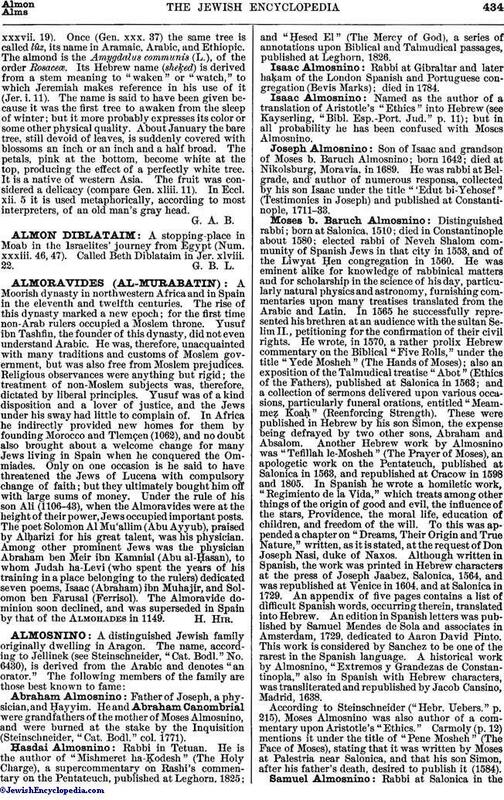 Among other prominent Jews was the physician Abraham ben Meir ibn Kamnial (Abu al-Ḥasan), to whom Judah ha-Levi (who spent the years of his training in a place belonging to the rulers) dedicated seven poems, Isaac (Abraham) ibn Muhajir, and Solomon ben Farusal (Ferrisol). The Almoravide dominion soon declined, and was superseded in Spain by that of the Almohades in 1149.